The Ridgid table saw was one of the first job site table saws. It was very innovative and the other tool companies got caught with their pants down. Did the Ridgid Table Saw Have Wheels? This table saw has wheels on it so it can be rolled right to your project site. The blade depth knob and the tilt adjustment are centrally located on the front of this portable table saw. Where Can I Buy This Saw? CLICK HERE to see about buying a job site saw like the Ridgid one. 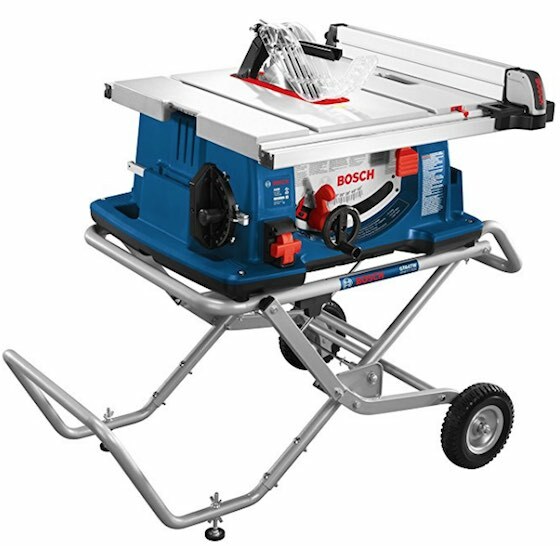 I now have the wonderful Bosch job site saw that has the spectacular gravity-rise stand. The Ridgid Table Saw is no longer made. Where is the Rip Fence Stored? The ripping fence stores right on the side of the table. That keeps it handy and you know where it is! The rip guide also stores on the saw. All the attachments are self-storing. This model features a work table that pulls out to provide support for large pieces of wood. The electrical cord has its own storage reel and an exhaust outlet is included for connecting to your dry/wet shop vac. Once the job is finished, the table saw folds up for easy storage in your garage. Look for these features when selecting your table saw. I own this saw. It's quite accurate and it's easy to store. It's not a $2,000 Powermatic saw that you'd use to build fine cabinets, but it works for 99% of the stuff around your home. CLICK THE PHOTO now to have this saw delivered to your home. I haven’t seen this saw, so I can’t comment on it. I’m curious about the fence. Does it lock down both front and back. I own a DeWalt DW745. It has a rack and pinion setup front and back that keeps the fence from moving under pressure. Does this saw have a similar setup? I no longer own the Ridgid saw. My Bosch job site portable saw has a rock-solid fence.